Being with my horse Scout was a magical bonding experience for me in the 1980's for we shared experiences from another lifetime when life was as simple and free as the wind and we were an integral part of it. But riding him at full gallop in the Sonoma hills and vineyards brought me full circle to another lifetime where we were once again a joyous one with nature and celebrating it together. 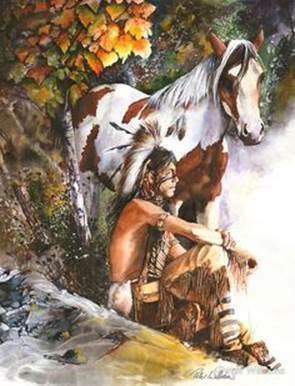 I understand at a profound level the love a native American feels for the land and their role as a protector of this sacred life sustaining bond. 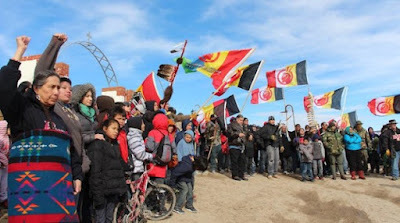 Bill McKibben writes in the New Yorker of the validity of this modern day Native American uprising which will not go away and speaks with innate authority ~ "They speak with real authority ~ no one else has lived on this continent for the long-term. 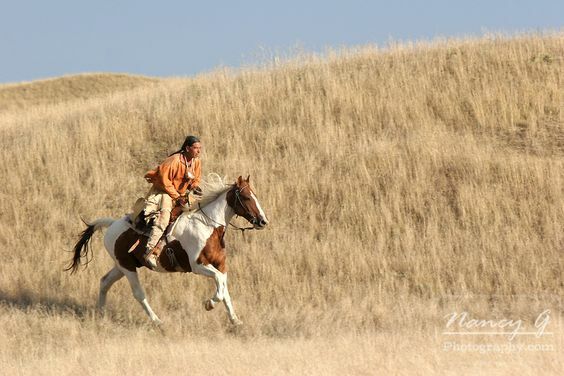 They see the nation’s history more clearly than anyone else, and its possible future as well. For once, after all these centuries, it’s time to look through their eyes. History offers us no chances to completely erase our mistakes. Occasionally, though, we do get a chance to show we learned something. " 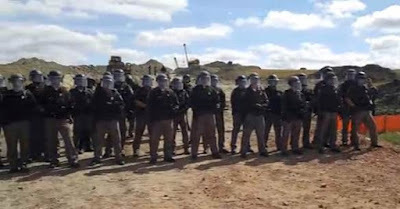 McKibben continues ~ One man in the camp last week said it was the most diverse gathering of Native Americans “since the Battle of Greasy Grass,” known to the white world as Little Bighorn. In other words, America’s shameful history with its native inhabitants is echoing across these Dakota riverbanks this late summer and it's gaining momentum. Rebecca Solnit, Guardian UK, who was at Standing Rock for two days calls it only the beginning of a truly transformative moment in our history ~ " What’s happening at Standing Rock is extraordinary and possibly transformative for native rights, Sioux history, and the intersection of the climate movement with indigenous communities… What’s happening at Standing Rock feels like a new civil rights movement that takes place at the confluence of environmental and human rights and grows from the last 60 years of lived experience in popular power and changing the world. 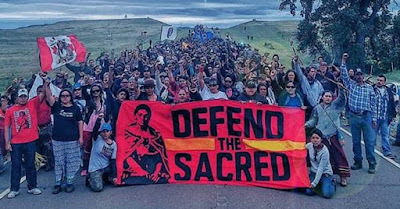 This is already a movement with national solidarity ~ there were support demonstrations in San Francisco and Tulsa, Oklahoma, among other places ~ and a national day of action is scheduled for Tuesday… the larger movement that the uprising at Standing Rock has begun, and the connections it strengthens. It’s only a beginning but it’s a spectacular beginning and a reminder that sometimes the future is made by dreamers and warriors who come together unexpectedly." When the green hills are covered with talking wires and the wolves no longer sing, what good will the money you paid for our land be then. And what's in the way of this movement? Corporate America and its political and financial allegiance to Fossil Fuel ~ along with the obvious support of Hillary Clinton and Donald trump but most certainly not Green Party Presidential candidate Jill Stein who was also protesting the pipelines at Standing Rock and has already been issued an arrest warrant. Wake up, America ~ there is an extremely strong anti-establishment chord being found in America this election year but the Oligarchy still rules the Democratic Party, which includes both the Clintons, and unfortunately as John Atcheson writes in Common Dreams ~ "The Democratic Party still lives in Davos-land, a place where it’s still possible to believe ~ or at least pretend ~ that serving the ultra-rich and corporations while purporting to represent the people at the same time is anything but a conflict of interest " ~ but the people, including myself, aren’t buying it this election year and the establishment beware ! 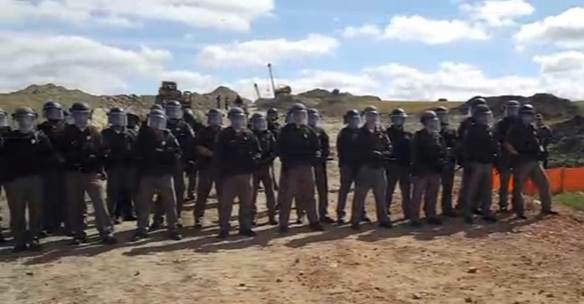 I stand with Amy Goodman and Jill Stein in protecting the Sacred Native American land from the political and corporate interests that control America and fervently hope that Jill Stein will carry this message to the American people in the Presidential debates later this month ~ even if she has to occupy them. This column strikes a deep ancestral chord and I know my great great grandfather would be proud that I am making this public stand.